Ellin Forest, outside the Altaire Camp. The time machine needed to go to Ellin Forest. This is a camp in the past version of Victoria island. The name of the area and certain landmarks seem to indicate it is set up in the area of modern day Ellinia. At this period in time, Victoria Island is almost totally unpopulated. There are some Fairies, however no other friendly species live here. Altaire Camp is the headquarters of a group who have immigrated to Victoria from Rien, seeking refuge from the tyrannical rule of the Black Mage, a recurring villain who plays an important role in the lore of MapleStory, starting with Nautilus Harbor, Rien, Edelstein, and Magatia, among many other areas later on. Additionally, Athena Pierce, the archer job instructor, can also be found here as a child. 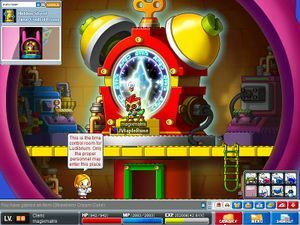 Altaire Camp can be reached by using the Time portal in Ludibrium's Time Control Room, at the top of Helios Tower. Most of the monsters look like enormous, prehistoric, scary versions of modern Victoria Island monsters. The Forest of Poison Haze Party Quest is based on Ellin Forest, serving as one of the five Cross World Party Quests; to participate, you must be at least level 70. The goal of this Party Quest is to put a stop to the poisoning of the forest, a dastardly deed apparently caused by the Black Mage himself. Upon entering the Party Quest, all party members are transformed into heroes to stop the poisoning of the forest. Talk to Spiegelmann via lightbulb. Talk to Yuris in Ellin Forest: Altaire Camp. Talk to Loha in Ellin Forest: Altaire Camp. Talk to Loha in Altaire Camp. Talk to Tess in Altaire Camp. Obtain 50 Moss Snail Shells from Mossy Snail in Mossy Tree Forest Entrance or Eastern Region of Mossy Tree Forest (one portal to the west and to the east of town, respectively). It is recommended to collect 100 Shells, since you will need 50 more for another quest later on. Go into the house right of her and talk to Athena Pierce in Altaire Camp: Camp Conference Room. This is where you meet the younger version of Athena Pierce. Talk to Athena Pierce in Camp Conference Room. Talk to Perzen in Altaire Camp. Obtain 50 Forest Stones from any monster in Ellin Forest. This quest is completely optional. You do not have to complete this to get the medal. The Forest Stones are a semi-rare quest drop. Talk to Yuris in Altaire Camp..
Talk to Ellin in Deep Fairy Forest, two maps right of Altaire Camp. Talk to Ellin in Deep Fairy Forest. Obtain 50 Moss Snail Shells from Mossy Snail. Deliver Sweet and Sour Orange to Yuris. This quest reveals that Yuris is the mother of Kyrin, the explorer pirate instructor. Obtain 100 Tree Trunks from Tree Rod in Southern Region of Mossy Tree Forest 1 or 2, accessed from the bottom portal at Mossy Tree Forest Entrance. It is recommended to do this quest at the same time as The Violent Forest. Talk to Shadrion in Southern Region of Mossy Tree Forest 1, accessed from the bottom portal at Mossy Tree Forest Entrance. Talk to Shadrion in Southern Region of Mossy Tree Forest 1. Tree Rods are found in the same map as Shadrion. Talk to Lohd at Mushroom Hill Entrance, accessed from the top portal at Mossy Tree Forest Entrance. Talk to Lohd at Mushroom Hill Entrance. Eliminate 150 Mossy Mushrooms in Mushroom Hill Entrance. or Mossy Tree Mushroom Forest. Mossy Mushrooms are found in the same map as Lohd. Talk to Sion in the Tent House in town. Talk to Sion in Tent House. 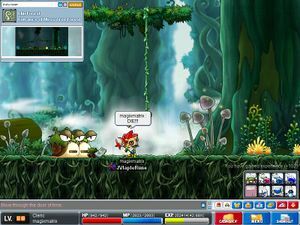 Obtain 50 Black Mushroom Spores from Mossy Mushrooms in Mushroom Hill Entrance or Mossy Tree Mushroom Forest. It is recommended to do this quest at the same time as Lohd? Dark Lord? Head to Western Region of Mossy Tree Forest 2, 3 maps directly to the left of town, and talk to Rius. Talk to Sion in Western Region of Mossy Tree Forest 2. Obtain 100 Rubbles from Stone Bugs. Stone Bugs are found in the same map as Rius. Head to Boulder Mountain Entrance, 4 maps to the left of town, and talk to Kanderune. Talk to Kanderune at Boulder Mountain Entrance. 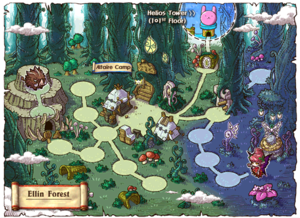 Primitive Boars are found in the same map as Kanderune. Eliminate 150 Violent Primitive Boars. Eliminate Chao and obtain Chao's Tusk. Violent Primitive Boars are located at Rocky Mountain Cave, accessed from Boulder Mountain Entrance. Chao is located at Deep Inside the Cave, which is accessed from Rocky Mountain Cave. Deliver Chao's Tusk to Loha in Altaire Camp. Talk to Perzen when he appears in Camp Conference Room. Talk to Perzen in Camp Conference Room. Eliminate 150 Ancient Fairies and 150 Shining Fairies. Ancient Fairies are found at Mossy Tree Forest Trail and Fairy Forest 1. 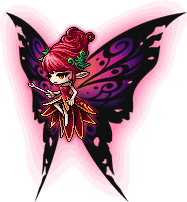 Shining Fairies are found at the latter map and Fairy Forest 2. Ephenia is found at Queen's Hiding Place, accessed from Fairy Forest 2. Athena Pierce in Camp Conference Room. This page has been accessed 104,067 times.